Whoa, I was waaaaaaay off!? Haha! Thanks for the clarification. 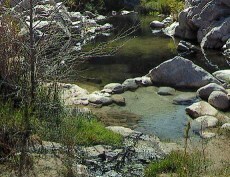 I used to take Bowen Ranch 45 mins to the springs on a nice jog down. One to one and a half hour hike back. How many miles is Bowen Ranch? The parking fee and lack of coverage turned me off from going thru Bowen. Happy trails! See you all at the springs.